Taito has announced Kickthrough Racers release for the end of September without giving a specific date: the game is available in some arcades in Japan since September 21. 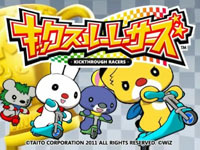 Kickthrough Racers features the same kawaii characters that made the success of Hopping Road, released in March 2009. The gameplay is almost the same (the player must perform movements to move the character) but this time it's on kids scooters: you must press the pedal at the rear to speed up. Taito also added a button on the handlebar for throwing things as in Mario Kart, which promises even more wacky races than in Hopping Road. 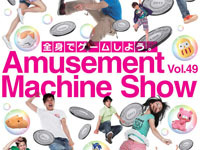 Tomorrow begins the 49th Amusement Machine Show. 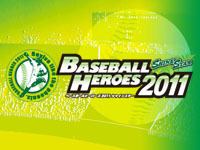 Organized by the JAMMA association (Japanese Amusement Machine Manufacturers Association), this exhibition brings together Amusement leading companies such as Sega, Bandai Namco and Taito. Let's look at what's new: Bandai Namco reveals Dark Escape 3D, a horror shooter in a 3D immersive booth. But also a new Taiko no Tatsujin released for the series 10th anniversary with an 32" LCSD screen and additional speakers. The highly anticipated Wangan Midnight Maximum Tune 4 will be also present and the newly Tekken Tag Tournament 2 released today. The impressive medal game Pokémon World Medal will be also showcased. On Taito stand, you'll find Chou Chabudai Gaeshi! Kyojin No Hoshi with the characters from the anime of the same name. Gekitou Densetsu Block King where you have to throw balls on the screen, Magical Music, Mogutte Hore Hore, Hopping Road Kids and Kickthrough Racers, several re-released titles on NESiCAxLive (Puzzle Bobble, Homura, Daemon Bride Additional Gain, Raiden III and IV, Samurai Spirit Sen, Trouble Witches AC and En-Eins Perfektewelt) but also the new Persona 4 The Ultimate In Mayonaka Arena. Sega presents Border Break Air Burst Ver.2.5, Hatsune Miku Project DIVA Arcade Version A, Sega Network Taisen Mahjong MJ5, Answer x Answer Live! AA and Virtua Fighter 5 Final Showdown for arcade games, Hakoekan Manpukusuizokukan for kids and medals Arabian Jewel, Lady Luck, Medal de Fantasy Zone, StarBoat, Star Horse 3 and That's Paradice. Tekken Tag Tournament 2 finally arrives in Japanese arcades tomorrow. It's to be said that Namco and Katsuhiro Harada heavily hypes the game since the announcement of its making during the Tougeki 2010. This follow up to Tekken Tag Tournament released in 1999 runs on System 369 and uses the same principle with 2-on-2 fighting where members of a same team can be interchanged at any time during the fight. Partner can also be called for 2-on-1 attacks, combos, throwing enemies against walls. This way, you can inflict more damage but also destroy the walls and thus land in a new area. Another feature of TTT 2 is the pairs of related characters (father/son, robot/creator, ...), they have special poses in case of victory or defeat and they can make special combos (Tag Assault) that inflict more damage. 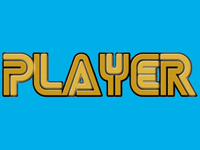 Multiplayer has an important place in this episode: up to four players at once can share a local game and the game can be played online worldwide in teams of six. 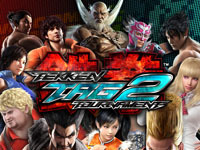 Tekken Tag Tournament 2 supports Bandai Namco's BANA Passport to save data and unlock costumes and weapons: Each character is customizable to the last detail and can carry thirty objects that can be used in combat (Item Move). The number of playable characters reaches record number with forty fighters: all those who were in Tekken 6 as well as older characters such as Jinpachi Mishima (Tekken 5), True Ogre (Tekken 3) and Jun Kazama (Tekken 2). A new character joins the cast: Jaycee, a masked wrestler. The story is a bit stupid as usual with Tekken: Heihachi Mishima has developed a drug able to rejuvenate and increase the longevity. He of course tested it on himself and to show that he's now the strongest, he organizes a new King of the Iron Fist tournament but the reason of this Tag rule is not clear). 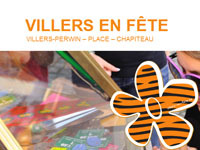 It's gonna be party time in Villers-Perwin this weekend! Many activities will be organized on the village square from Friday to Monday for the occasion: petanque, giant role playing game, astronomy, trivia, tastings, Thaï-bo, dancing, ... Video games will be part of the show thanks to Retroludix association that will transform the main tent into a Luna Park on Saturday from 13:00 to 19:00. Retroludix will offer the public free access to a dozen arcade machines (original arcade games and pinballs) and more than 15 home consoles and vintage electronic games (Vectrex, Colecovision, Super NES, Mega Drive, Neo Geo, ...). Retro arcade decorations and old packagings will be exposed. Three tournaments will be organized: pinball at 14:00, kicker at 16:00 and "mystery" video game at 18:00. See you tomorrow in Villers-Perwin (Les Bons Villers) in the province of Hainaut for a good time. 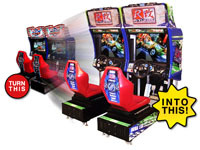 Sega informs us of the immediate availability of a R-Tuned conversion kit for Sega Race TV. We already told you about R-Tuned - Ultimate Street Racing in our ATEI 2009 report. It's a tuning themed racing game featuring 25 American and Japanese drift and muscle cars, 3 realistically reproduced cities: New York City, Hong Kong and Tokyo (Shinjuku and Shibuya), unlimited boost and 3 driver views. Up to 4 machines (2 twins) can be linked up for multiplayer games. Kit includes step-by-step instructions with pictures, all needed wiring and connectors, a new billboard, a new steering wheel, a complete set of decals as well as the game DVD-ROM and owner's manual. Order your kit today at Sega Amusements. 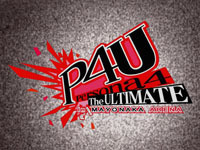 Atlus has announced that Persona 4 The Ultimate In Mayonaka Arena will be released during Spring 2012. 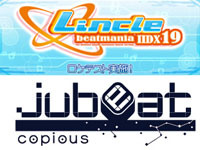 This 2D fighting game is developed by Arc System Works and runs on Taito (NESiCAxLive), it will be also released on consoles but in Summer. Persona is a series of role-playing games released on consoles telling the story of a group of adolescents with psy powers enabling them to summon Personas. Persona 4 The Ultimate In Mayonaka Arena takes place 2 years after the events of Persona 4 and features characters from Persona 3 and Persona 4. 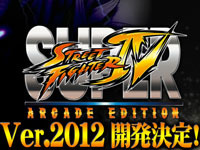 There is still no information about the gameplay but we already know that it will playable with four buttons. Persona 4 The Ultimate In Mayonaka Arena will be presented at the Tokyo Game Show 2011 that will take place from September 15 to 18 at Makuhari Messe.